DETECTIVE COMICS #486 - Early John Workman lettering! 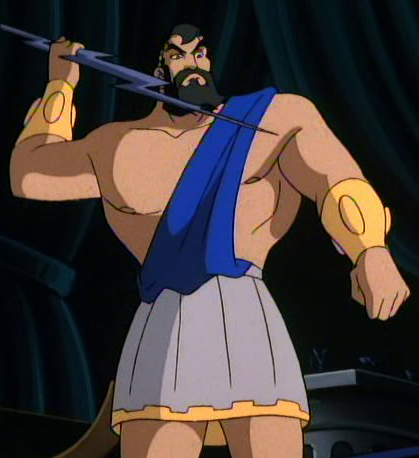 O’Neil is back to Maxie Zeus already, even though he was hinting at an ongoing League of Assassins arc. 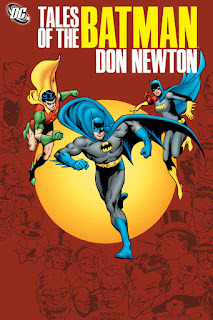 Nothing remarkable about the story, but it’s a fine showcase for Don Newton. 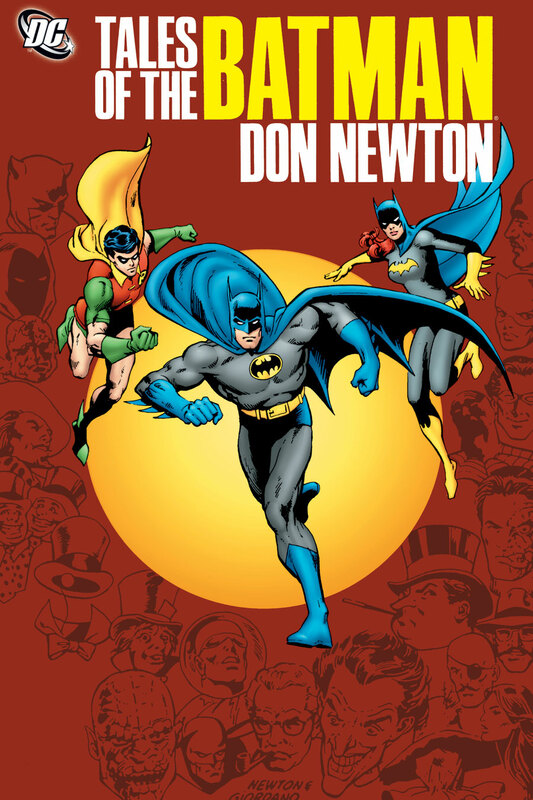 Newton’s Batman is eerily similar to Alan Davis’ Batman in the ‘80s. Both are influenced by Neal Adams, but it’s amazing how close Davis came to Newton at times. Newton also evokes that gangly, odd Gene Colan anatomy at times, although I think Colan is years away from Batman at this date. BRAVE & THE BOLD #156 - “Corruption in the police force? Impossible!” says Gordon, unaware of what the ‘80s will bring BATMAN. A murdered cop makes a deal with a demon to avenge his sullied name -- sounds dark and disturbing, but really it’s more Silver Age goofiness. Somehow this leads to the GCPD being possessed by demons, all out for Batman’s blood. Newton has a chance to channel Ditko for a few pages here. 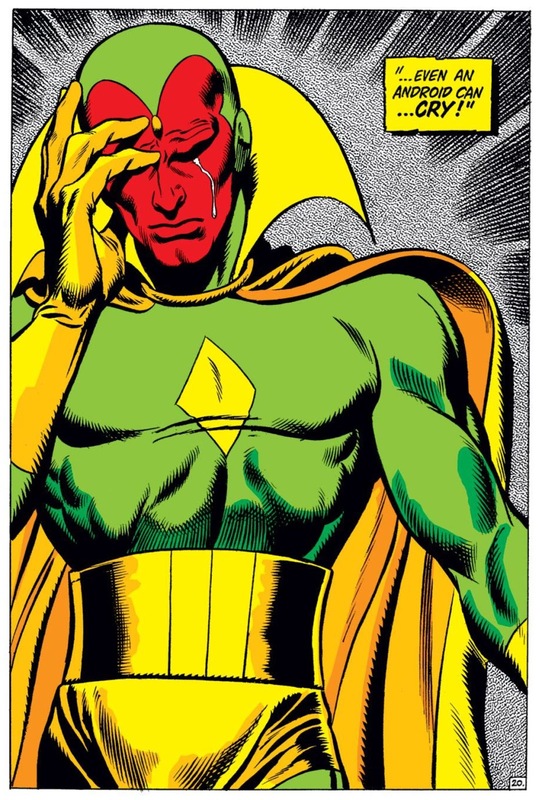 Another connection to Alan Davis -- both have Neal Adams and Ditko as influences, even though they’re nothing alike. DETECTIVE COMICS #487 - Are you ready for Ma Murder? Even though O’Neil’s known for taking Batman back to his roots, he never shies away from silly villains. And his Batman always has a since of humor. The stories themselves aren’t jokes, but Batman himself isn’t so grim. He’s willing to sneak up behind a villain in a movie theater and swipe popcorn out of her bag, for example. 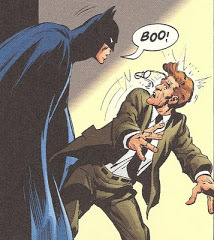 Or the famous “BOO!” panel that John Byrne loves so much. DETECTIVE COMICS #488 - Guest writer, Cary Burkett. I admit I’m not that familiar with Burkett’s work, but he does a great job here. 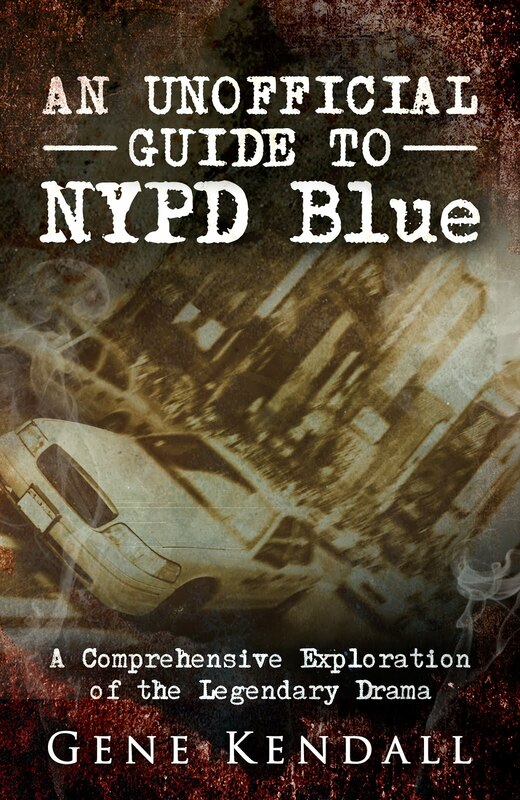 Burkett delivers a high concept, a murder mystery, and numerous action scenes into just 17 pages. The story involves a death row murderer writing a book about his encounter with Batman--which is such a hit, his publisher is arranging to have him freed to make room for a sequel! Bruce Wayne is also dating a reformed Selina Kyle in these days, although none of the stories reprinted so far have shown this. Bruce’s personal life seems pretty much non-existent during this era. 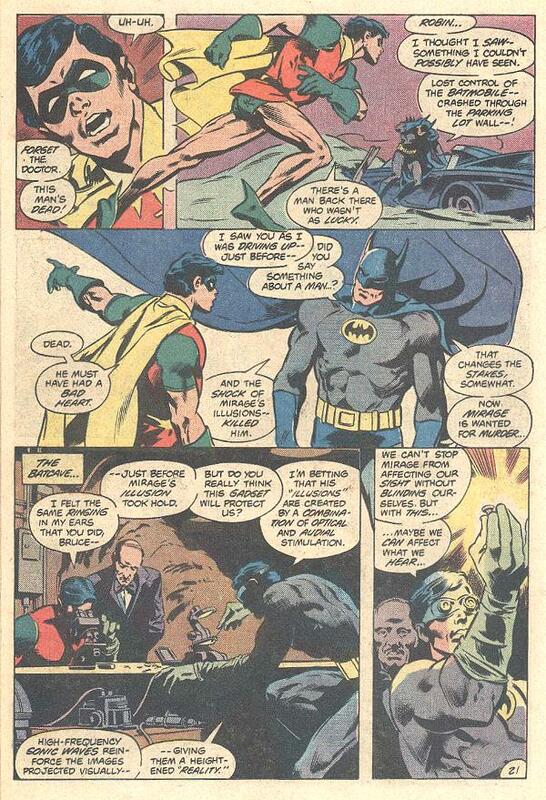 DETECTIVE COMICS #489 & 490 - So Ra’s had a bulky, bald henchman named Lurk, not Abu, in the ‘70s? Interesting to see O’Neil address his issues with violence even in these kinda silly old stories. I’m 208 pages into this book, and only now do I see the first period. Crazy to think DC waited so long in following Marvel’s lead and finally embracing the period. 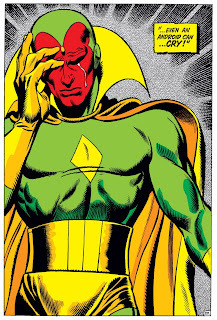 I realize some production issue prevented the period for years, but Marvel addressed it in the early 70s, I believe. DETECTIVE COMICS #491 - Oh, c’mon - Maxie Zeus again? I love how Batman is still hiding his cowl and ears under human masks - in 1980! Was surprised to see Batman confront a corrupt Irish cop named O’Hara this issue. O’Hara was still in the comics in the 70s, so I didn’t know if perhaps this was O’Neil’s way of writing him out. Turns out the TV cop is Clancy O'Hara and this guy is Bernard O’Hara. Still, it’s surprising that he’d use the name. You wouldn’t have Batman encounter a corrupt cop named Gordon, would you? DETECTIVE COMICS #492 - The return of Cary Burkett - and Batgirl! Burkett seems to be one of DC’s best writers of this era. He understands the shock value opening house style, but also brings more characterization & depth to his stories. Burkett also uses captions sparingly, and isn’t afraid to let the artist carry the story. Aside from the numerous exclamation points, this reads as something that could be published today. Somewhat surprised this issue wasn’t adapted as a Batgirl-themed episode of TAS. Gordon, Batman, & Batgirl all have nice moments, and the deadly military toys seem like something Timm would like. And the villain, Gen. Scarr, could’ve been replaced with ‘90s villain The General from ROBIN. BRAVE & THE BOLD #165 - Starring Man-Bat and his sick baby. Batman quickly discerns that a truck is running drugs -- because they don’t have a front license plate. More obscure DC continuity -- a Dr. Dundee, Bruce’s parent’s doctor, knows Bruce’s secret & patches him up when he’s injured. Seems like both Alfred and Leslie Tompkins have taken Dr. Dundee’s place since the ‘80s. Also weird that Bruce demands Dundee never ask him questions, when he already knows Bruce’s secret. And, wow, does Marty Pasko write a talkative Batman. He’s more of a motormouth than Spider-Man in this issue. I assume the point of the story is to return Man-Bat as a villain, using his sick baby as the motivation. I like the idea that his baby can’t sleep because she’s inherited acute hearing from her parents. I’m going to assume the baby was wiped from continuity, or something just horrible happened to her. You’re a baby in a superhero comic…unless your name’s Franklin Richards, you’re not gonna make it, pal. DETECTIVE COMICS #493 - Batman teams with the Swashbuckler, who I assume has been killed off by now, for the first time. Swashbuckler has an interesting design -- full-face masks and sinister, Ditko-esque eyes were in style at this time. One great thing about Newton’s art is how on-model it is. Batman and Riddler just look “right” throughout the issue. 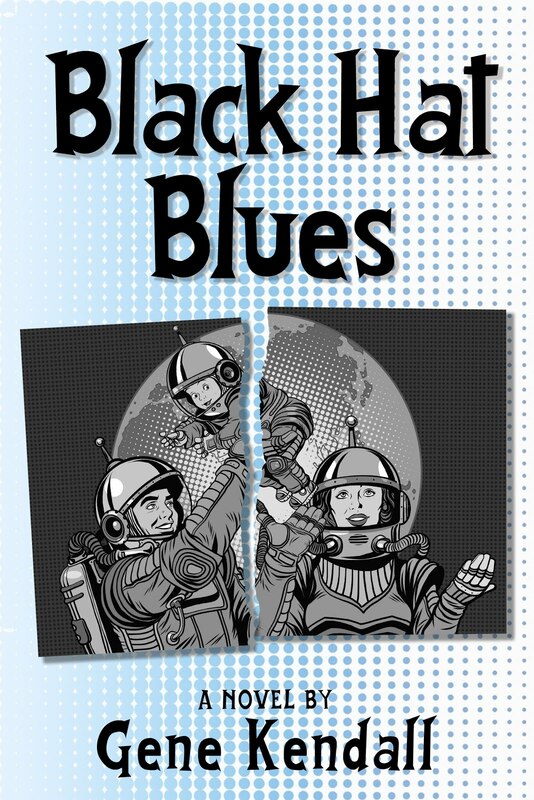 The comic is a silly story about a bored doctor who decides to plan heists for extra money, which he donates to charity. The story ends with Batman & the Crime Doctor trapped in an explosion, and it’s resolved -- after a totally unrelated story is reprinted, due to DC’s nutty reprint policy. BATMAN #328 - An early Marv Wolfman BATMAN story. Seems as if DC writers still believe each story has to open with a gimmicky high concept that’s dismissed by issue’s end. 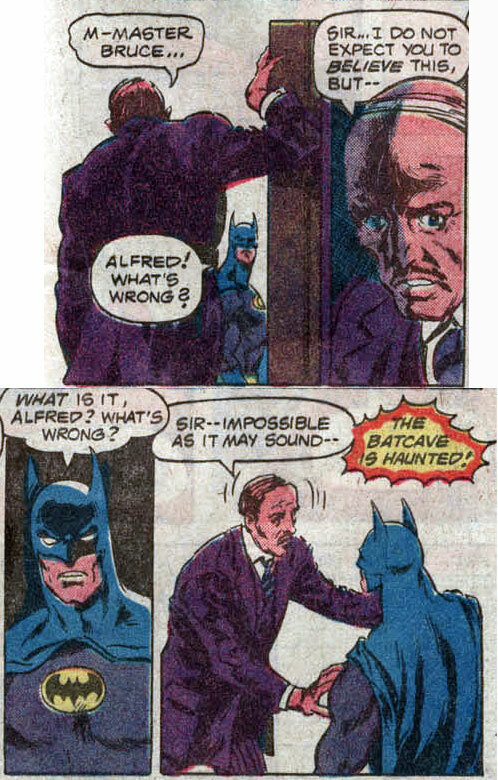 This issue -- Alfred believes the Batcave is haunted! Somehow, Jim Gordon’s first case from 35 years ago ties into this, and we learn that there’s no ghost at all -- just a nonsensical explanation that I’m sure Jim Shooter would’ve loved to drive holes through. DETECTIVE COMICS #495 - Back to the Crime Doctor. This arc is undeniably silly, but Fleisher generates some real tension this issue. Crime Doctor has discerned Batman’s secret ID, & Batman spends the issue agonizing over whether or not the Doc has revealed it to anyone. Meanwhile, the Crime Doctor just wants to get out of town and start over, terrified of both Batman and the mob. Batman ultimately saves Crime Doctor from the mob, but not before he’s poisoned --a poison that conveniently leaves the Crime Doctor a human vegetable. That’ll learn ya not to discover a superhero’s secret ID, ya dumb punk doctor. DETECTIVE COMICS #496 - Featuring the original Clayface and his floppy hat. The story opens with Batman swooping in to rescue a woman from a falling dinosaur statue -- a sequence that must’ve taken a full minute, given the amount of dialogue spouted by four different characters. From there, Clayface escapes from Arkham and seeks his revenge on a Hollywood producer who’s snubbed him. The plot’s very similar to the later Batman: TAS episode with the aging model as a villain. And is just as engaging. Clayface is a pretty nasty villain, though. Not only does he kill anyone in his way, but he carries literal napalm bombs into battle. 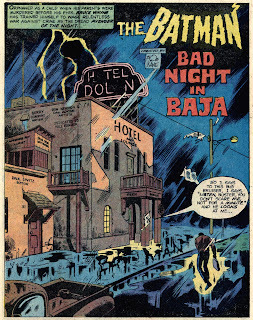 An early Gerry Conway Batman story, inspired by Will Eisner. Best installment in the trade. Conway follows the DC formula of a dramatic opening, but never cheats the reader with some lame copout later. 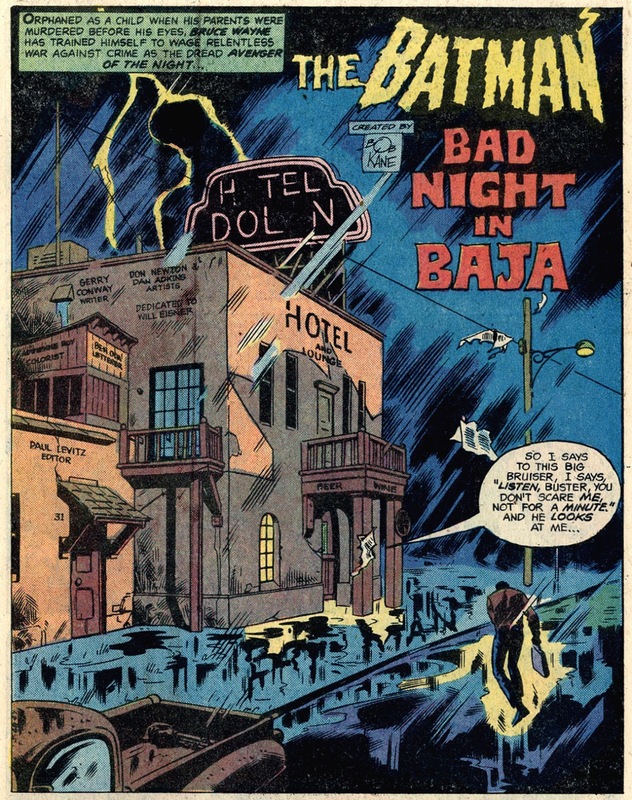 It’s a story of a wounded Batman entering a seedy Mexican saloon, its residents all facing different disappointments in life. Batman touches everyone’s life just by being there, even though some people still stubbornly refuse to learn a lesson. Also, Batman hurls a gas canister at a Rolls Royce and blows it up real good, so it’s got that going for it, too. yeah, shut up. -- Now "New + Notabale"
I don't want to turn my blog into a continued ad for my novel, but I would like to mention that yeah, shut up. 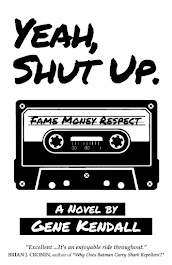 has been selected as one of Noisetrade's "New + Notable" novels for the week. 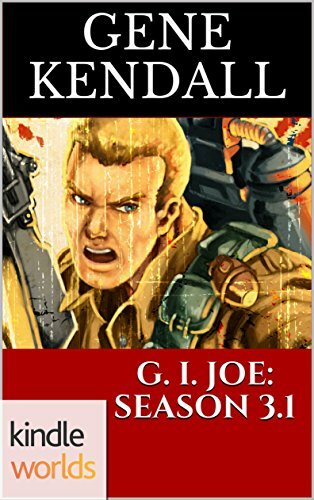 You can download the novel for whatever price you like (including nothing) at the link below. And if you've never checked out Noisetrade, it's a fantastic site that grants you access to artists and authors offering their work for download. Whatever your interest, you'll find something worth your time there. 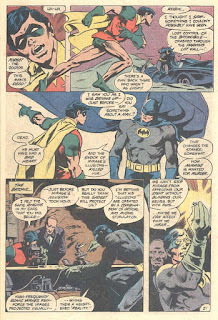 More from the late ‘70s/very early ‘80s era of BATMAN, one I’ve previously known little about. Thankfully, someone in DC’s reprint department must be a fan of the post-Neal Adams Batman days. Rozakis sets up an intriguing mystery -- a dead woman has been found with a ring that labels her “Mrs. Batman” -- which leads to a shady man invading Wayne Manor, boasting he killed the woman and knows Bruce’s ID. What a cliffhanger! 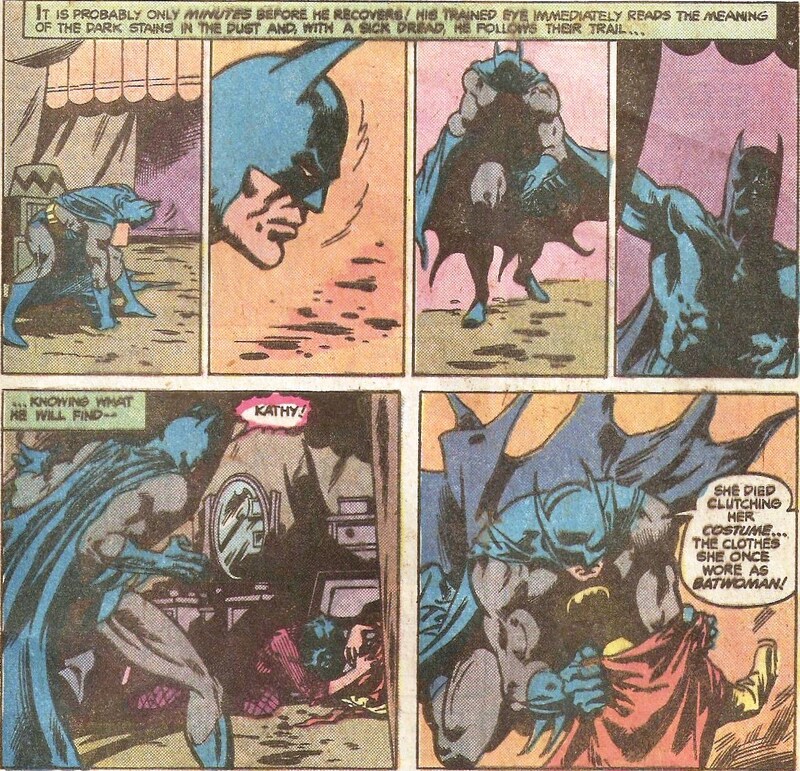 The book then moves on to…a totally unrelated story from DETECTIVE COMICS. I can appreciate reprinting issues in publication order, but would it be so hard to at least print the serialized stories without interruption? Also, this story is only a few pages long, so I’m assuming BATMAN was either a collection of short stories in this era -- or it had a main story with a backup each issue. 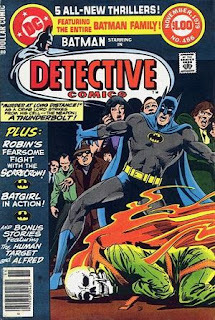 Also surprised to discover DETECTIVE COMICS was only on a bimonthly schedule in these days. DETECTIVE COMICS #480 - Not much here, although the villain’s design possibly inspired Miller’s mutants design in DKR. BATMAN #306 - The “Mrs. Batman” mystery concludes…and it makes no sense at all. The killer has framed Batman to keep him busy (presumably), while he unleashes a virus in Gotham’s ghetto. The story doesn’t exploit the secret ID angle at all, nor do we learn who “Mrs. Batman” was supposed to be. It reads as if Rozakis started one story & was abruptly told to change it into something else. DETECTIVE COMICS #483 - The inspiration (maybe?) for the “Appointment in Crime Alley” episode of the cartoon. Gerry Conway mentioned O’Neil’s Crime Alley stories on the Batman:TAS podcast. He was inspired by O’Neil’s portrayal of average Crime Alley residents, living in poverty. The citizens of Crime Alley are pretty dense as it turns out. They know Batman visits every year on the same day, which just so happens to be the day the Waynes were murdered, but no one, even Leslie Tompkins, makes the connection. The villain of the piece turns out to be Maxie Zeus, which is certainly an odd fit for a Crime Alley story. I much prefer the cartoon episode, which is maybe a bit slow, but has a consistent mood and nice heart to it. Not to take anything away from O’Neil’s work, though. He developed the template for Crime Alley stories and others have found ways to put their own touches on them. Batman:TAS producers clearly loved this era of the comics. I know that Timm is a massive ‘70s Marvel fan, and BATMAN was his only regular DC indulgence. 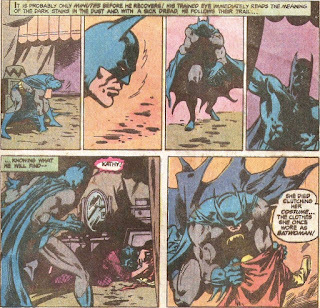 One moment this issue that’d never make into animation -- Batman has to kill three dogs! Hopefully, he doesn’t take it as hard as Rorschach did. Although that might explain “ninja psycho” Batman. DETECTIVE COMICS #485 - An early League of Assassins story. Hey, O’Neil has brought Batwoman back…and killed her off in three pages. A very early example of reviving an obscure character and then icing them. Not that Kathy Keane was ever a great representative of a female hero, but her death here is just cheap. Odd to see an early non-Neal Adams version of Ra’s Al Ghul. Newton draws him as an old man. Also, worth noting that Ra’s isn’t nearly as omnipotent in this early stories; not even the head of the League of Assassins. Best moment of the issue - the revelation that Batman memorizes EVERY license plate he encounters. Tonally, this is no match at all for the Denny O’Neil stories…plus, DC clearly didn’t have good copies of the original artwork to scan. I’m all for creator-specific trades, but I’m amazed at some of the stuff that makes it into the reprints now. Red Tornado swears he won’t cry at the story’s climax, because an android crying would just be ridiculous.